Note: Elayne Allebest’s 25 minute Egan Symposium talk was taken from her longer paper, which is included in full below. Several years ago, while researching old newspaper archives, I found a small ad in a June 1915 edition of a Salt Lake City newspaper announcing that Howard Egan’s descendants were getting together to create a family organization in commemoration of the one hundredth anniversary of his birth! I was impressed that someone could be so loved by his family that they would want to honor his birthday decades after his death. 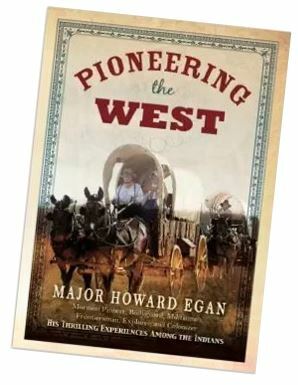 As a result of that gathering, Howard Egan’s journals were compiled, along with other items, and printed under the title Pioneering the West. Since its publication it has been cherished by his descendants and quoted by researchers in many disciplines. The family organization of 1915 also explored the possibility of having a statue of Major Howard Egan installed in Salt Lake City – but just didn’t have the funds to do so. If they had succeeded, we could be celebrating Howard Egan’s birthday in the same dignified and reverential manner in which they recently celebrated the birthday of Brigham Young! We have now gathered, 100 years later– it being 200 years since Howard’s birth – to celebrate the remarkable life of our common ancestor. • Why did they leave Ireland? • And why did they go to Canada, instead of the United States? What Were The Conditions In Ireland? 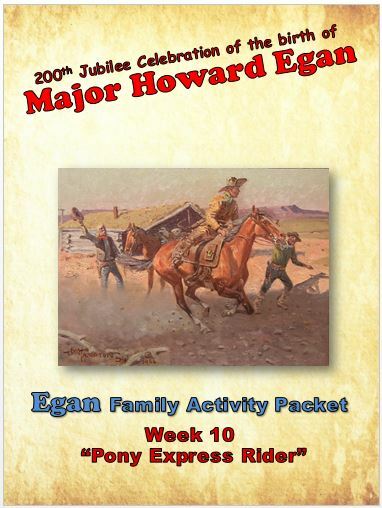 Most of the information we have about Howard Egan begins with the Nauvoo period. What happened before then? With these questions in mind, my husband and I began searching. We went to the National Archives in Dublin, and visited the parish and the county historical library in Tullamore, where Howard lived and went to school. That research led me to my perspectives on the forces that drove Howard’s family out of their homeland. A quick history at the outset should be helpful. In 1534 King Henry VIII broke away from the Catholic Church and created the protestant Church of England to facilitate his various divorces and to consolidate his power. But the Irish, who had been Catholic since the time of St. Patrick, would have none of it, and rebelled. For five years Henry VIII sought to conquer Ireland and bring it under crown control. In 1541, after putting down the Irish rebellion, he had himself proclaimed King of Ireland. But it would take nearly a century, and numerous brutal conflicts well into the reigns of Queen Elizabeth and King James the 1st, to extend England’s control over all of Ireland. King Henry died in 1547. And almost 100 years later, as a result of the “Irish Rebellion of 1641,” the “Irish Catholic Confederation” took control of most of Ireland. The British response initiated the “Eleven Year’s War.” By May 1652 Cromwell’s Parliamentarian army defeated the Catholic Confederation and occupied the country. The war resulted in famine, which was worsened by an outbreak of bubonic plague. During the eleven years of war, 618,000 Irish people, or about 40% of the country’s pre-war population, perished. To wreak even further havoc, anyone implicated in the rebellion of 1641 was executed. Motivated by his deep hatred for Catholics and the Catholic religion, Cromwell also had a series of Penal Laws passed against Roman Catholics (the vast majority of the population), denying Catholics the right to vote, own land, run for office, get an education, or own a horse worth more than 30 shillings. Furthermore,to raise money to pay off his army and to repay the London merchants who had subsidized the war, Cromwell confiscated large amounts of Irish land, and sold some 50,000 Irish people as indentured laborers, who were sent to the English colonies of America and the West Indies. As additional retribution: no Catholics were allowed to live in towns; the practice of Catholicism was banned; and bounties were offered for the capture of priests, who were executed when found. To establish and maintain control, the British crown carried out a policy of land confiscation and colonization. Protestant colonists were sent to replace Irish Catholic landowners, who were removed from their lands. Before the Eleven Year’s War Irish Catholics had owned 60% of the land in Ireland. By the time of the English Restoration, they owned only 20% of it. And during the Commonwealth period, Catholic landownership fell even further, to 8%. Even after the Restoration of 1660, Catholics were barred from all public office. In 1620 the first Lord Digby, Earl of Bristol, was given Geishill Barony, comprising about half of King’s County (now known as Offaly County) in which Howard Egan’s family later lived. If laid over a map of Dublin, Lord Digby’s 30,000+ acres would swallow up much of Dublin’s current real estate. Confiscating land from the Irish, and then requiring them to lease it back, had devastating consequences. To make matters more complicated, if a son converted to the Protestant faith, he alone could inherit has family’s land, and there would be nothing the family could do about it. This caused terrible conflict, as people had to weigh their religious principles against their survival instincts. At some point the Egans, from which we descend, converted to the Protestant Church of Ireland. His verbal jab inferred not just gullibility, but a capitulation to the English Crown that the proud Irish clansmen detested then, and to some extent (understandably) detest today. “Throughout Ireland, the doubly melancholy spectacle of a strong man asking for work as the means of getting food; and of the fertile earth wooing his labours, in order to yield up to him it’s rich but latent stores: yet [the land] lies idle and unfruitful. … [Why? Because] the whole of this land, cultivated and uncultivated, is owned by a few proprietors– [and] many of them are absentees– [who] from ignorance, or false theory, or indolence … prefer seeing the land covered with such misery as we have described. Their greatest ambition, apparently, is to get rid of the people. Of course the British could not get rid of the Irish. Who would pay them rent money to support their extravagant lifestyles and work their baronies? Who would fight their wars? In the years that followed, England was involved in a number of military conflicts, and poor Irishmen were, as always, needed for “cannon fodder.” In a way, the Irish bartered their military service for concessions at home, in Ireland. In 1803 Britain declared war on Napoleon’s France, and thereafter fought America in the War of 1812. 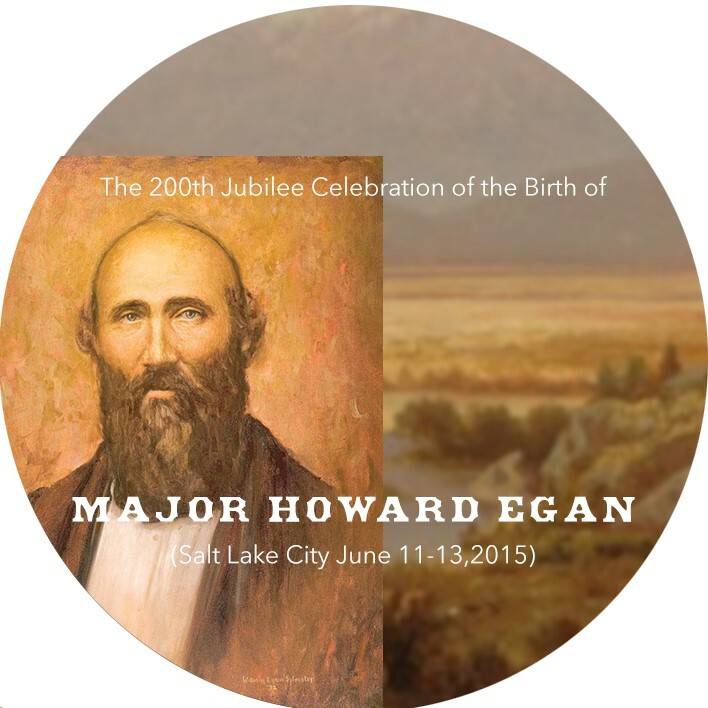 Both of these wars ended with the defeat of the French in 1815, which brings us to the year Howard Egan was born. As a result of the armistice, just when farmers were prospering, the bottom fell out of the agricultural market which had been fueled to feed the warring armies. Prices that the Irish had been paid for their crops were now cut in half, but the prices they paid for everything else – rent, clothing, and livestock – remained the same. The year 1815 was disastrous for another reason. As Anne Meath entered her third trimester of pregnancy with our common ancestor, Howard Egan Jr., an event occurred halfway around the world that dwarfed the carnage of the Napoleonic Wars. On a little island in Indonesia, there was a colossal volcanic eruption, the likes of which had not been seen for at least 1,300 years. The blast of Mt. Tambora ejected more than 36 cubic miles of ash and pyroclastic material into the sky. On a cultural level, some interesting things happened. In June 1816, “incessant rainfall” during that “wet, ungenial summer” forced Mary Shelley, Lord Byron, and their friends to stay indoors for much of their Swiss holiday. In their boredom, they decided to have a contest to see who could write the scariest story, leading Shelley to write Frankenstein for the amusement of all the guests. Most of the Northern Hemisphere was affected. The effects of the ash cloud were felt in China, Europe, and North America as well. New England was particularly hard hit. Vermont‘s population dropped by 10 to 15 thousand people, which erased the previous seven years of population growth. Residents of Vermont, finding that the crops they planted in the spring were quickly frozen, replanted them — only to see them frozen again in June, and July, and August. Among the residents to leave that year for warmer climes, was the family of Joseph Smith, who moved to Palmyra, New York. The climatic conditions in Ireland created catastrophic problems for Ireland’s inhabitants. Now that we have a portion of the larger historical picture, what was happening in King’s County, where Howard Egan lived? If you were traveling in Ireland, and someone asked where you were from, you probably would not tell them you were from “the Avenues” or “Sugar House.” You would say you were from Salt Lake City, or just say “Utah.” Similarly, Howard said he was from “Tullamore.” If you looked at a Google map of the Meelaghans today, it looks like there are only a dozen or so dwellings in the “Meelaghans” and many are modern. It also has no defined boundaries or local administration. “Annaharvey” is the same. It lies to the west another two miles or so. And it would be hard to declare the exact distance between them, because no “center” exists for either of them. [The exact latitude and longitude of the Egan birthplace is: 53° 15’ 24.83” N; longitude: 7° 25’ 53.12” W.] You can find it by looking at the Google Earth website. During these difficult times in Howard’s childhood, what educational opportunities were available for Howard and his siblings? It is evident from reading Pioneering the West that Howard did have a respectable education, even though universal free education was not available to the Irish until 1831, six years after I believe the Egan’s left Ireland. Later the Catholics developed makeshift structures for schools. There was a hedge school in the Meelaghans Townland where the Egan’s lived, and one in Annaharvey, approximately two miles down the road to the west – they were Catholic, but included Protestant children as well. Going to a Protestant school, however, would have been an advantage for the Egan children, even if they had to go to Killeagh, a little less than three miles away to the south. Protestants were far more literate than Catholics at the time. And Lord Digby, the English Earl of Bristol, land owner of the Geishill Barony, and in power in Howard’s day, is said to have had a certain zeal to convert children to Protestantism, in an effort to “civilize them.” And Protestants would have been favored over the Catholics for educational sponsorship. Perhaps the Egans, sometime before the years we are looking at, converted to Protestantism, in part to give their children an education, and in part to throw off some of the burdensome penalties of the Penal Laws. In order to have a superior education, it was worth paying a bit more and travelling a little farther, to go to the Protestant school in Killeigh. Ann Meade would have made sure her children went to school, and most likely this Protestant school. The Protestant headmaster, John Baynham, earned seven pounds a year teaching there. The school itself was built by Dean Digby, out of lime and stone, though it was in bad repair in 1824. In the summer of 1824, the last year that the Egans were in the Meelaghans, there were twenty students enrolled: 12 male students and 8 females. Only one of them was a Catholic. All others were Protestants. When Did The Egans Leave Tullamore? On February 15th, 1823,two weeks after giving birth to twin girls, Howard Egan’s Jr.’s mother, Ann, died. Some have speculated that she died due to complications of childbirth – but succumbing to the added effects of typhus, or severe food shortages, cannot be ruled out. Howard Egan (junior) was then seven and a half years old, and his father was left with ten children to care for. Almost exactly one year later, on February 18th, 1824, Anne’s mother, little Howard’s grandmother, Elizabeth, died at age seventy-seven. That might have been the final blow to the family’s everyday life in Ireland. At some point they must have realized that it was not going to be possible to continue life as usual in the Meelaghans. As a mother, it is hard for me to imagine that the Egans left the Tullamore area right after the death of Anne Meade. How would they leave with newborn twins that were not yet weaned? With a grandmother still alive, as old as she was, there was someone to help with the younger children, but after her death, how could they cope? The family had to investigate where they would move, how they would get there, and how they would pay for passage. They would have had to make arrangements to sell their equipment, their animals, and to sell whatever leasehold time was left on their leased land. They also had to find a wet nurse, or two, to take care of their precious babies until they could be weaned. It could have been a cousin, an aunt, or a neighbor who nursed them, and who later begged them to leave the weakest one until she was stronger and could travel– because they left one of the twins, Margaret (also known as “Greta”), in Ireland. Certainly they would have wanted to send for Margaret later, when they were settled. If not, they would have had to make arrangements with a relative who would promise to care for little Margaret for the rest of her life, if she lived. We have not been able to find a record indicating if she lived or died. The book Pioneering the West contains a photo of the tiny, three-room, thatched roof “cottage,” built by Bernard Egan, Major Howard’s grandfather. Remember, even though his grandfather had built the cottage, they didn’t own the land it stood on. The interior of the Egan cottage as it appeared in 2015. It was used as an outbuilding for the farm. It was owned by Tom Dunne, the man next to me. He was a bachelor farmer who left business matters to his niece. The last resident of this cottage was Howard Egan’s cousin, twice removed, known locally as “Poet Egan,” who lived there until he died in 1940! It had the same earthen floor, no plumbing, no heat other than the fireplace, and with a roof of thatch! This three-room, dirt-floor cottage, built Howard Jr.’s grandfather, was most likely a typical rural dwelling of the period. Even though his grandfather had built the cottage, it is unlikely that he own the land it stood on. The land was inevitably leased from British aristocracy. Every acre would have belonged to Lord Digby. The leases were originally for a thirty-one year period, but later reduced to twenty years. As I mentioned earlier, a major typhus epidemic (not typhoid fever) occurred in Ireland between 1816 and 1819, precipitated by the partial famine caused by “The Year Without a Summer.” As many as 75,000 Irish citizens perished during this period, from either disease or famine. The British government heard reports of the calamities in Ireland, but they ignored them. The Irish were always “crying poverty”, and to the Brits it was just another manifestation of Irish indolence and over population. It was not until the collapse of crop prices started to hit the English pocketbook that they began to listen. When Howard Jr. was three years old the British government, in order to assess the conditions of the people in Ireland, sent a survey to those who would know the most about the residents of the area – the clergy. Father James Kinsella filled out the questionnaire for Killeagh Parish(the Church of Ireland parish where Howard Egan’s baptismal records are found). Q. “What is the ordinary diet, and condition with respect to clothing of the laboring classes in your parish? In fact, the population of the country of Ireland experienced population explosion before this time for a number of reasons, including the development of an inoculation for small pox. Q. “What numbers of persons in your parish subsist by begging? When I read about conditions at the time of Howard’s youth, I was filled with sadness for him, for his family, and for all the agrarian inhabitants of Ireland at the time. Despite these conditions, there was a “Baby Boom” after the War – as there often is after war when soldiers come home. The accumulation of these terrible economic, health, and population conditions resulted in mass emigration from Ireland. The year 1815 began a period of significant immigration to Canada, involving over 800 thousand emigrants over a thirty-five year period. Europe was gradually becoming wealthier as a result of the Industrial Revolution, but population growth left more and more people unemployed. North America was long on land and natural resources, but short on laborers. Ireland, on the other hand, had plenty of laborers, but no work! If you enter the “cabin” of the Egan family in the Meelaghans today, after having read the report of the conditions in the 1820’s from the Killiegh parish priest, it is not difficult to imagine those very conditions existing there at the time the family emigrated. The patriarch of the family, Bernard Egan, was alive when the younger Egans left. That must have been a difficult departure. He was 64 years old at the time. He died in 1857, at the age of 97, in the “Poor Union” in Tullamore near where the Offaly County Historical Centre is today. (See illustration below.) It was also known as the Work House, Old Folks Home, or Infirmary.) He died 33 years after the family immigrated to Canada. Perhaps after their departure he stayed with relatives in the Meelaghans until he became infirm or senile, and then went into the Poor House. We will never know. We do know that the people who died there were often buried in the Kilcruttin graveyard. Michael Byrne, a Tullamore historian, comments in the 1980’s that the graveyard was in a “terrible condition” and that “the number of slabs does not in any way represent the number of burials.” Sixty tombstones were still there at the time of his writing, all from the 1770s to the 1850s. After the Potato Famine it became so full that a new cemetery was made available. One author I read suggested that Europeans and Americans thought of Ireland much as someone might think of Somalia or Yemen today. Their citizens were perceived as very poor, uneducated, superstitious, and violent. A racial and ethnic bias against the Irish was also evident in writings and cartoons, both in England and America. Though the examples to the right are from a later period, they illustrate the longstanding perception of the Irish as unattractive and detrimental to society. An historian at the Offaly County Historical Society suggested that during the Egan’s era the family might have received emigration assistance from the British government. It is also possible that Lord Digby assisted some of his tenants to emigrate. Beginning to feel the economic pinch resulting from too many Irish travelling to England for work, the government began exporting its poverty to Canada, South Africa, and Australia rather than house it on its own shores. The closest sea port to the town of Tullamore, and the largest exporter of “the needy poor,” would have been Dublin, about 68 miles away. Dublin would also have been the easiest port to reach because the Grand Canal ran from Tullamore, through a series of locks, directly to the port of Dublin.The Canal, built the 1700’s is a mile and a half north of the Egan cottage, but to embark to Dublin, they would have likely gone three miles west to Tullamore’s Bury Quay. Because ship’s passenger lists were not usually recorded until 1865,we are not able to identify the ship in which the Egan family crossed the Atlantic to Canada. People who secured free passage and the promise of free land from the British government were classified as “Assisted Emigrants.” They would have been expected to settle in and help build up their British Colony of Canada, NOT the USA. The English were not at all keen to have those who traveled across the Atlantic, on British funds, to then cross the border into the country with which they had just fought a war. But it happened frequently. In 1825 the boys in the Howard Egan family were Richard, Howard, John, and Barney, who would have been 6, 10, 13, and 15, respectively. The Egan land would not accommodate being divided into four parcels for the four sons. And remember, they most likely did not OWN the land. They inevitably leased it from Lord Digby. So there was nothing to leave the boys by way of inheritance, and nothing to sell. They might have made some arrangement to transfer their land lease for a price. Some landlords allowed extremely distressed tenants to leave without paying any past rents they owed. The financial situation gave them little hope they could pay any sum on which they might be in arrears. “Mr. Bonon rose to propose that a certain sum should be granted to his Majesty for the removal of emigrants from the south of Ireland to the Cape of Good Hope and Canada. It was not the intention of Ministers to propose a renewal of this grant on any future occasion. He stated that the principle on which the system of emigration from the south of Ireland was conducted was a sound one. The error of all former systems was, that the emigrant on his arrival at the Colony, was left without any means of immediate support. Under the present system the error was avoided; and every emigrant might on his arrival be sure, with the exercise of common industry of procuring a livelihood. Government has received the most flattering accounts of the success which had attended the present system… Under these circumstances, he felt justified in proposing the present vote. The undertaking was merely in the nature of an experiment, which might, in its operation, affect a partial benefit to Ireland. So we know that the British government was sponsoring the removal of families to Canada. The actual number of Irish emigrants that came to Canada through a government program at this time was most likely somewhere between those two numbers. A man named Peter Robinson very successful assisted privately-organized Irish emigrants to their Canadian destinations. His clients contracted with him and were assigned an agent to travel with them, supplying all they needed for the trip, helping them find a homestead claim, and acquiring needed supplies and equipment when they got there. Some family researchers have suggested that the Egans might have come with him. The Robinson group, however, was exclusively Catholic, and the Egan family was not found among any of the Robinson pioneer rosters. According to ships lists of arrivals in the summer of 1825, it averaged 44 days to get to from Ireland to Quebec. There was little privacy, poor sanitary conditions, and the food that families were given in steerage had to be prepared by themselves. Because the Egan family of left no records of their voyage, written accounts from others who made the same journey are informative. Ralph Waldo Emerson wrote of his transatlantic trip: “The road…[across the Atlantic] …as they who have traveled it well know, is very long, crooked, rough, and eminently disagreeable.” Sanitary conditions and odors must have been difficult, to say the least. There was also not enough fresh water aboard to be used for personal bathing or laundry. And drinking water was often kept in a closely watched barrel, with a cup on a string for everyone to use. Most Canadian immigrants landed in Quebec, although there were arrivals in lesser known ports such as Halifax. Some immigrants were sold “a passage to Canada” and left in Halifax, only to find out that to get to the nearest civilization where they could get land, required another sum of money almost equal to that of their initial fare from Ireland! The weather had much to do with the timing of the trips. The St. Lawrence Seaway freezes up in November and doesn’t thaw until around April. To get to Montreal from Quebec, they would have had to disembark the sailing ship, and change to a steamship with a shallower hull. Transatlantic ships have center boards and deep draughts, not as suitable for plying the waters of a river, so passengers and freight must be transferred to steamboats.That trip took about four days as they would be sailing “upriver” against the current. To come back “down” to Quebec took half that time. Were they were planning on settling in the city of Montreal? I find that idea unlikely. They were farmers, not merchants or shopkeepers. Land was what they needed for their sons. That land was being given out freely to the west where the British were encouraging settlement. The Egans would not have stayed in Quebec long, as there was a race west, to get to where deeds to land were being distributed. This was not an incident of “chain immigration” where family had gone before and prepared a destination for the rest of the relatives. Most travel and communication in the 1820s was by navigation. Sailing ships were used at first, but then by 1819, there were seven steam-powered boats between Quebec and Montreal. One method of proceeding inland to the west and south after arriving by sailing ship at the port of Quebec, was to take passage in one of the St. Lawrence Steamboat Company vessels to Montreal. In 1824, the La Chine Canal was built to allow boats to bypass the roiling rapids just past Montreal into the area which later became Toronto, (at that time, “Pierce” and “Yale”) where the land was being distributed. This steamship company was started by the Molson family as a way of moving their popular brewery products to market. After seeing the Fulton steamboat on the Hudson River while visiting New York, John Molson realized that he could save money by shipping his own products. Over the next few years he had more steamships sailing the waters of the Canadian North West than were in all the other steamship companies in Canada and even in the US. Riding in a steamboat would have been a unique experience for the children in the Egan family, as nothing like that was ever seen in the Grand Canal in Tullamore. The Irish canal boats the Egans were familiar with were mostly pulled along by horses on pathways next to a narrow, shallow channel, as one would have seen on the Erie Canal in New York. Steamboats were “high tech” in 1825. Steamboats burned a lot of wood, but not very efficiently. During the voyage to Montreal from Quebec, they were compelled to stop three times to load more wood for fuel. It was hazardous to your clothing to stay on deck as large, burning cinders flew out of the smokestacks and often landed on the passengers’ clothing, burning holes in them. Some immigrant settlers arriving in Quebec sent family members on ahead of them on stage coaches to the land offices in hopes of getting better properties. The “chemin de roi” was a road to Montreal that opened for the first time in 1825 and made for faster time than a steamship, but coaches would have been too small and too expensive for the Egans. One wonders what kinds of conversations the Egan children had with their father during the long journey. Did he advise them to live morally? Be honest? Find a good spouse, and settle down? Was the whole family exuberant about their lives unfolding in a new land, or were they simply exhausted and homesick for all that they left behind? When the Egan’s arrived in Montréal, the city’s population was larger than Québec City’s, and it was surpassing it as the center of trade and commerce. In 1825 it had 22,540 inhabitants, with a dynamic merchant class. Where it had once been a wild and woolly center of fur trading, the wealthier class was making money from the import and export trade. They invested in banking and maritime shipping. Canada began to expand economically and financially as a result of innovations in navigation, and due to the increased freedom from Napoleonic blockades which were lifted in 1815. From 1816 to 1827 the number of post offices went from 10 to 42. The revenue from postage doubled and the circulation of newspapers tripled. People, goods, and ideas were being exchanged at an ever increasing rate. As an example of the increased activity, the Quebec papers reported that on May 26th of 1824, there were 31 vessels in port with 45 settlers received. Exactly one year later, on May 26th of 1825, a couple of weeks before the Egans arrived, there were 211 vessels in port with 2,157 settlers received. The high rate of emigration from Ireland was unequaled in any other country, and reflects both the overseas demand for immigrant labor and the appalling lack of employment and prospects for the average Irish person. About 80% of Irish immigrants who left their homes in this period were between 18 and 30 years old. But it was not hard to see the lure of living in America. The British government was not keen on paying for passage for people to become settlers in the British territories, only to have them cross over the border into a country with which they had fought a war only 12 years prior. The idea of Assisted Immigrants was to strengthen the British Empire and improve trade while relieving itself of the burden of the poor house –not to increase the population of the nascent America state. While researching through the lists of people who had come to Montreal, I found an “Agan” (Egan) family of ten (10), travelling up the St. Lawrence River, on the vessel Chambley, (one of the many steamships owned by Molson Brewery family). Remember, spelling at this time was phonetic, and not yet standardized. The fare for all ten of them was four (4) pounds, to be paid as they arrived at their destination – something like a toll road payment today. The ship’s log states that they paid three pounds six shillings, and that one pound four shillings was still due. They apparently could not pay the entire fare when it was time to leave the steamship. In the margin is scrawled a cryptic note: “Left a bed, Sent to brewery.” This is the transcription of the ship’s entry. This was puzzling. What did “Left a bed, Sent to brewery” mean? In looking through all of the ships’ lists of passengers sailing in the season of 1825, there were some aboard who were forgiven small shortfalls when they lacked a couple of pence and a notation was put into the ‘Remarks’ column stating that it was “All she had.” The Agan’s “shortfall”, however, was not a few pence. It was 24 shillings! And one pound four shillings was not 14 shillings. It was 24 shillings! The English pound was not decimalized until 1970, so each pound then had twenty shillings. It had cost Howard Senior 30-40 shillings to rent his land for an entire year.One wonders why they would leave the boat owing so much. Was it all they had? Did they arrive destitute? Is that why they didn’t go on to obtain land? The ship’s log noted that when the “Agan’s” disembarked, they “left a bed.” Looking over all the ships logs for that summer, I saw that a few others left personal articles as collateral against what they owed. One passenger left a ‘flute’ when he was short on his fare. Another left a ‘watch’ “in pledge.” That the Agans left such a necessary and personal item as a bedroll, the very bed covers they had used crossing the Atlantic, suggests that they didn’t have anything else of utility or of sufficient value with them to use as collateral. It appears that the Molson brewery, located at the docks they had built, functioned like a temporary homeless shelter and work house, providing work for immigrants arriving without a prearranged position. The man in charge of the Brewery was the brother of the proprietor of the steamship line! Their father, John Molson, purchased an established brewery in 1789 which has been operating ever since. There was a booming demand for their products as more and more immigrants arrived, and more trade was conducted throughout Canada. By 1825 he was a very wealthy and influential man who served in the Canadian Parliament. He left his three sons to run his bank, his brewery and his steamboat line respectively. Was it perhaps he who arranged with the British government to a give jobs to the unemployed emigrants who arrived on his dock? John Molson became a philanthropist, marrying a destitute divorcee who was hired by him years earlier as a housemaid. By the year 1825, he had enough money to build a theater for the City of Montreal. The homeless shelter near the docks in Montreal is today called “Mission Old Brewery.” It was formally established 130 years ago, not far enough back to cover this time period, but shows the tradition of wealthy brewers helping the homeless. A very unsettling newspaper article may explain one of the reasons the Egan family stayed in Montreal rather than moving farther inland. The incubation time for the small pox virus could take as long as 17 days. On occasion, small pox can spread by being in enclosed places with others who have the virus, such as being in a ship’s hold when travelling in steerage – which is how the Egans traveled. Most patients contaminated will recover, but death occurs in up to 30% of small pox cases. Those who have suffered from hunger or malnutrition have an increased risk of fatality. Until the last scab falls off, the person should be considered contagious. If the Egans had contact with anyone who had small pox around the 16th of May in 1825, while aboard a sailing ship or in Quebec or Montreal, when the break out was noticed, it would have become evident within the next few weeks. Whether it was smallpox, typhus, or some other disease, illness and death shadowed the Egans. If it was the 7th of June, 1825 when the Egans arrived in Montreal (which I propose it was), they had need to contact the Anglican parish church within a very short time – because three weeks later, on the 30th of June, Eighteen-Twenty-Five(1825), John Bethune, the Rector of Montreal’s Christ Church writes in the parish log the fate of the twin daughter they brought with them. No cause of death is included. There was no mention of the place of burial. Registers of headstones and cemeteries in Montreal do not bear their names. Howard Sr. was then only 44 years old. His wife had died only two years prior, leaving him the care of his 10 children. His mother-in-law Elizabeth, Howard Jr’s grandmother, died a year later. And then, in a largely French-speaking foreign land, he lost three more children,all within a four week time span. It is entirely possible that Howard Sr., and some or all of the other children, and perhaps even Howard Jr., were also sick, but survived. Somehow the family struggled on. Three years later, his beloved daughter, Catherine, was married to John Ransom, the revered namesake of my mother Inis Egan Hunter’s “grandpa,” and my great grandfather. Then three years later, in 1828, Howard “Hagan”, age 47, died – leaving six (6) living children. When and how Howard left Canada for the United States is a question for future family history researchers. But if he went to sea as was rumored, when seeing the contrast between the two countries, Howard immigrated to the United States as soon as he could. Hopefully, documentation about his life and travels to Salem, Massachusetts will someday come to light. What can be learned from studying the lives of the Egans from the Meelaghans, and from Major Howard Egan himself? 4th, that our own families – our present-day Egan families – can do hard things if we really have to – not because of any genetic predisposition that we inherited from our ancestors – but because we stand on the foundations of their faith, their hope, and their charity. 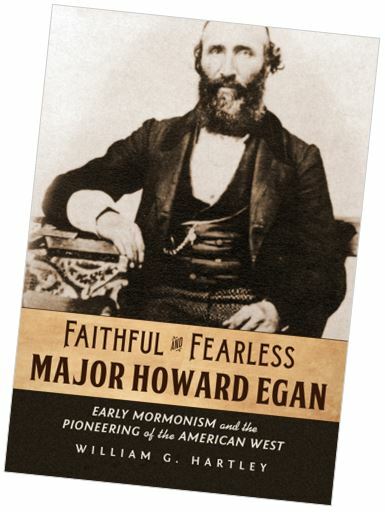 If this “mere” man, Howard Egan, and his life can be celebrated 200 years after his birth, there is reason to believe that our faith, our hope, and our charity, can make a difference for our descendants, for centuries to come – whether we are heralded personally, as is Howard Egan, or not. Howard Egan’s life was forged by his early hardships and poverty, and by the loss of so many of his family members. He pursued dozens of occupations, and adapted readily to each as he saw the opportunities open up for him to make life better for his family. It was not prosperity for its own sake that he sought, or even to enrich himself, but to build the Kingdom of God as he envisioned it. If he was following riches, California held far more financial opportunities for him, yet he always returned to Utah, the Saints and the family. He and Tamson were always generous to those in need. His adversities set in motion a life of hard work and perseverance, so as never to be poor again, and a search for a way to be joined with his beloved family members after death – a message and pathway which he believed Mormonism provided. The Long Ridge, Towards a History of Killeigh Parish, by John Kearney, Esker Press, Tullamore. For Offaly Heritage Centre Ltd., Bury Quay, Tullamore, County Offaly, Ireland 1992 p.70. Letter to Karen Stoddard, Salt Lake City, in my possession. aboard the packet ship ,New York, 1833. Sellar, Gordon, The Narrative of Gordon Sellar who Emigrated to Canada in 1825, location 382 (of 1772) Kindle edition. Note the spelling of Howard Sr.’s wife’s last name: “Maid.” It gives us an idea of how a non-Irish listener would have heard the name’s pronunciation. To my ears, while in Ireland, I would have also written their pronunciation of Meade, Mead and Meath as “Maid.” There was a very soft “d” at the end that was somewhere between an American ‘d’ and a ‘th’. The sound differences, after having them repeat it to me several times, were indistinguishable to my ears. Analogous to the blend of “b”/”v” sounds found in some Spanish dialects.